This week I got my hands on a fascinating little volume at the local library’s ongoing book sale. 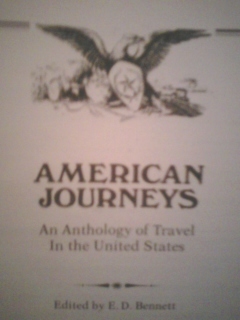 “American Journeys, An Anthology of Travel In the United States,” (Travel Vision in association with the Exxon Travel Club, 1975) is a collection of excerpts from pioneer diaries, explorer’s journals and articles about travel in America from the late 1600s up to the lunar landing. It includes pieces from such writers as Benjamin Franklin (describing his trip to, and first night in, Philadelphia), Charles Dickens (writing about a steamboat trip with his wife in 1842. He did not like it), Mark Twain (a description of a stagecoach trip, excerpted from his book “Roughing It”) and John Muir (recounting one of his long walks among California’s sequoia trees). In the light of the glorious day.